Based on market cap and enterprise value Timber and Building Supplies Holland (TABS Holland) is actually not that tiny and obscure. Most of the stocks I own are smaller, but in this case the float is ridiculously small. 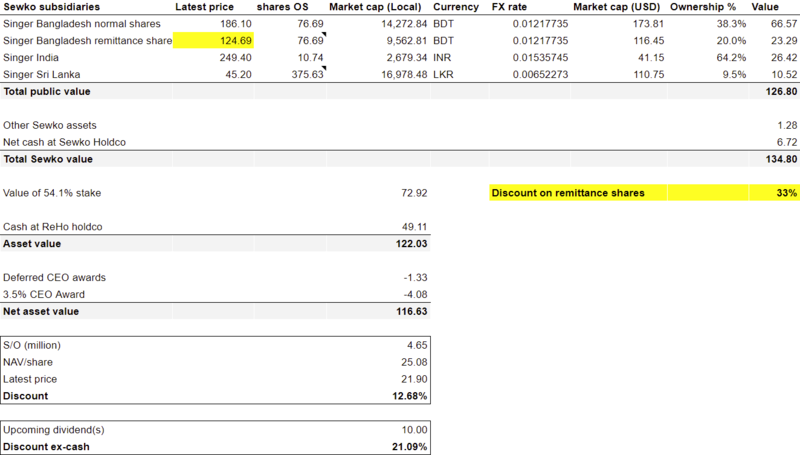 According to VIB.net the free float is roughly 3% which translates to less than €6 million. Most of the shares are held by HAL Holding while management and some other “big” shareholder own the rest. Before trying to figure out how much this business is worth it’s a good idea to start with a look at the historical financials, even though that might not be that useful in this case. In 2015 PontMeyer NV acquired Deli Building Supplies and the combined company continued as TABS Holland. The acquisition basically doubled the size of the company. The transaction was completed the 1st of September, so in the financials for the year 2015 the last four months include the results of Deli Building Supplies while 2016 was the first full year of the combined company. When looking at the historical results it is clear that TABS Holland isn’t a great business. Revenues didn’t grow at all in the 2011-2014 period while profitability was around breakeven. Only in 2015 and 2016 things started to turn around in a big way. While the acquisition of a big competitor can’t have hurt, I think the main reason is simply the fact that the Dutch housing market has rebounded after the crisis and is now running white hot again. The low for the Dutch housing market was in 2012 and 2013, while now things are pretty crazy again. I live in Groningen, which isn’t as hot as Amsterdam, but I have never seen so many houses being renovated or just being torn down and rebuild in my neighbourhood as in this year. So it’s not a surprise that the more recent results are pretty good, and presumably the full year results for 2017 will be even better. The timing of the acquisition was certainly excellent! It was a big acquisition, and to finance it TABS Holland issued a bunch of new shares while the amount of debt outstanding also exploded. They have been paying down the debt rapidly, and last year they even found some money to pay out a decent dividend. How much is TABS Holland worth? it’s a good question. It’s a cyclical business that probably is near the top of the cycle. The housing market in the Netherlands isn’t showing signs of slowing down yet, but when you play a game of musical chairs the music always continues playing until it doesn’t. Based on current earnings the business is clearly cheap, but a lesson about cyclical businesses that stuck with me is that they are best bought when they appear expensive, not when they appear cheap. But maybe a 6.6x P/E ratio is cheap enough to overcome this risk. A reasonable base-case scenario is perhaps to assume a couple of years like this year, followed by more average results (adjusted for the doubling in size of the company). This gives some credit to the current good results, while also building a bit of mean reversion into the valuation. In the valuation I have doubled the operating profit numbers from 2011 till 2014 to account for the fact that the business is now roughly twice as big. Since 2015 already included 4 months of the combined company I multiplied those results by a factor 1.5. This gives us an average operating profit of €21.2 million. Deduct €1.4 million in interest costs (assuming they keep operating with the current debt load), deduct 25% in taxes and normalised net income is €14.9 million. Slap a 10x multiple on that and we have a €149 million terminal value. Additionally I will assume that the next 3 years will be great, and the company will earn €30 million in each of these years. Discount this with a 10% rate and we get a valuation of €182 million. The current market cap is actually a bit higher than that, so to me the market price seems pretty reasonable. A P/E-ratio of 6.6x sounds pretty cheap, but at the same time I don’t want to be paying a 10x ratio if it’s indeed near a cyclical top. When I read about TABS Holland I thought that it was a pretty interesting situation, and I already had opened a NPEX account and transferred some money. After doing a little bit of research I’m less convinced. The company doesn’t appear particularly expensive, especially compared to other publicly traded equities, but at the same time it isn’t obvious cheap either. I think a conservative valuation needs to take into account a bit of mean reversion at this point in time, and because of that it should be looking cheap from the outside. You could come up with some reasons why looking at the past results is too pessimistic or why a 10% discount rate is too high though. The combined company probably has realised some synergies while the market has become less competitive. I have to admit that I would have loved to buy something on such an obscure platform as NPEX, but I think I’m going to pass on this opportunity… TABS Holland is probably a bit undervalued, but not enough for me. This entry was posted in Research and tagged TABS.NL on October 24, 2017 by Alpha Vulture. If you are looking for an actionable idea you can quit right away, because the BIND Therapeutics stock has been cancelled months ago so there is nothing that can be bought or sold anymore. But if you like reading something about a bizarre situation you are at the right address here. For those who don’t know anything about the story, a little bit of background information. BIND Therapeutics filed for chapter 11 bankruptcy protection in early 2016. It managed to sell its assets to Pfizer for enough money to pay back all creditors with some money left over for equity holders. So far all pretty straightforward, but the liquidation plan came with an interesting twist. The company picked a sort of random date (August 30, 2016) as the record date of which shareholders would be eligible to receive all future liquidation distributions. As a result the stock became basically worthless after that date, but since the stock continued to be traded for some time it offered shareholders a nice way to profit twice. I sold my position for something like $0.30/share which was a substantial windfall since I estimated liquidation distributions to be roughly $1.20/share while I bought the stock around $1.00/share. Part of the reason that the stock continued trading at an elevated level was probably the involvement of a fund that apparently bought approximately one million shares after the record date. They have been, and still are involved in litigation, against the trustee (and FINRA as well I believe) trying to change the liquidation plan/the record date for future liquidation payments. So far they have been unsuccessful, but they haven’t given up yet. Their latest move is an attempt to convert the liquidation from chapter 11 to chapter 7, presumably to make it possible to work around the the record date confirmed in the chapter 11 plan. While this is already weird, it got even weirder this year. After paying an initial liquidation distribution last year the trustee sent a letter to shareholders that they would be required to fill out an equity distribution form and a form W8/W9 in 180 days in order to be eligible for future distributions. This piece of paperwork proved a bit tricky to complete. You needed to provide the signed tax form to your broker, and your broker needed to sign-off on the number of shares you owned on the record date. A process like this has a lot of points where things can go wrong. Your broker might not notify you of the requirement to do the paperwork, is unable or unwilling to do the paperwork, or things simply get lost in the mail. As a result shareholders owning 75.05% of the company provided tax forms and equity certification forms. This means that a relative large part of the shareholder base isn’t getting any money from future distributions, either because of their own inattention or the inability of their broker to process the form. Based on some unhappy shareholder letters in the docket not all brokers were willing to do this. Luckily for me Interactive Brokers proved to be quite capable in handeling this weird situation. As a result the second liquidation payment contains a nice windfall profit for those who did manage to do all the paperwork. The first liquidation payment of approximately $8.0 million resulted in a distribution of~$0.38/share while the second liquidation payment of $8.0 million resulted in a distribution of ~$0.51/share. As an added twist, because the payment wasn’t made to all shareholders it couldn’t be processed by the Depository Trust Company (DTC) and instead shareholders got a paper check. In the Netherlands checks haven’t been used in decades, and this was the first time ever in my life to receive one, but luckily my bank is able to handle them for a nice fee… It also creates a nice tax headache for those owning the stock in for example an IRA account since you are effectively doing a withdrawal from your account. He sells them to person X. So how to deal with this situation? If I would claim ownership of 100 shares, and person X would claim ownership of 100 shares the liquidation trust is going to pay money to the same shares twice. If I couldn’t claim ownership of the shares, but only person X (I think this is the most correct implementation) I wouldn’t be able to fill out the equity distribution form. Maybe person X doesn’t fill out the equity distribution form. So there is no payment to X, and the short seller could claim that there should also be no payment to me. But lets say that I owned another 100 shares that I did successfully fill out the paperwork on. Now it’s clear that I got a certain payment per share. The short seller is supposed to pay me whatever I would have gotten on the shares if I would not have lend them out. So he would be on the hook for the $0.51/share payment. But how would that money get to my account? I know I got the payment, but it’s a paper check. My broker doesn’t know how much if any money I got and the same goes for the depository. And even if they would know, can they fix it on an account by account basis? If this is not yet messy enough, if I would have owned all the shares and done the paperwork the distribution/share would have been a little bit lower for everybody (still assuming X didn’t do the paperwork). So maybe the short seller shouldn’t pay the full $0.51/share? Or what about the case when the short seller closed his brokerage account in the time between the cancellation of the stock and this liquidation payment. Is his broker then on the hook for it? If anyone has anything intelligent about this to say I’m interested. Did you lend out any shares? Did you get paid on these shares? Someone who has been short this stock on the record date? Lending out shares to short sellers is supposed to be sort of risk-less. But I’m pretty sure the process breaks down in this obscure case. My guess is that either some people lend out a few shares, and simply didn’t get paid on those, or the trustee paid twice (or more) for some shares “screwing” everybody else by a tiny amount. This entry was posted in General and tagged BINDQ on October 20, 2017 by Alpha Vulture. It’s probably a sign of the times that every self respecting value investing blog has to have a post about bitcoin. And when you tell a random person that you invest the first question these days is if you own (or trade) bitcoins or not. So I guess “The Alpha Vulture” can’t stay behind, and share with the world what it thinks about bitcoin, whether you want to hear it or not. As the title of this post implies I’m skeptical about bitcoin, and most other software projects that are based on blockchain technology. To explain why I’m skeptical I’ll first try to explain in the simplest possible way what the whole fuss is about because I suspect that part of the reason why people are so enthusiastic about the blockchain is the fact that they don’t really understand the technology. If you read an explanation about bitcoin you hear cool terms like distributed trust (which is actually cool) and stuff you probably don’t understand without a computer science background (like hash functions). These things are actually not that hard to explain, but not really necessary to understand the key idea behind the blockchain. What you basically do is, instead of trusting security to a single party that (hopefully) has a smartly designed system you substitute that by a large amount of computational power provided by multiple parties. There is a lot more to it than that, but that is just noise and implementation details. The fact that you don’t rely on a single party is great! I’m not going to dispute that. The fact that the security is provided by a large amount of computational power is bad. Just a large amount of computational power would actually not be bad. Chips always get faster and more efficient. But it’s not just a large amount, it’s a relative large amount. The security only works because the amount of computational power required to “take control of the network” is simply too expensive for a malicious third party to acquire (even temporary). So if chips get 10 times faster the computational power required to keep the network secure simply increases with the same factor. If chips get 100 times more energy efficient, the amount of energy required to keep the network secure doesn’t drop at all. Additionally, the amount of computational power required scales with the value of the transactions being done on the network. You need enough computational power to make it unattractive for an attacker to acquire even more computational power and take control of the network. How much computational power this exactly is, is quite an interesting theoretical question (I don’t know the answer). But for sure the amount is high. An attacker only needs a short moment to inflict huge and long-lasting damage on the network. They could for example double spend coins, hurting not only those who would receive them, but also causing a massive loss of trust in the system that would be longer lasting. So why is this all so problematic? It’s simple: high computational power requirements translate into (relative) high transaction fees. And that’s a problem for a lot of the applications that have been proposed for the blockchain. Using bitcoin as a currency is the biggest obvious problem. Most banks for example process millions of transactions daily, and most of these transactions are almost free because running a nice secure sever that handles a million transaction a day isn’t a lot more expensive than one that handles just a few transactions. I’m using the blockchain and bitcoin sort of interchangeably in this post. I know it’s not the same. I doubt this is true. There is probably some complex relationship between both the cost of new chips, the energy requirement and perhaps even some other tangential factors. At least not a factor million more expensive. Scaling performance is still hard. It is also going to be hard for bitcoin. Average transaction fees are now already ~$4, and this is despite the fact that miners are currently also compensated by newly mined bitcoins. Currently miners get 12.5BTC for every block mined. With roughly 2,000 transactions per block and a current BTC price of ~$5500 one transaction actually costs almost $40. I used to own a couple of dozen bitcoins in 2011 or something like that back then when mining them on your own graphics card was still economical. Sold them between $20 and $30. Still better than buying two pizza’s for 10,000 BTC though. This entry was posted in General on October 15, 2017 by Alpha Vulture.